The motivation for hybridizing different species is to merge the best characteristics from each. Done right, you end up with an outcome that can be more than the sum of its parts. When it comes to a company’s email infrastructure, the same thinking applies: a hybrid solution that leverages the best of on-premises solutions with the SparkPost cloud service can deliver a host of advantages you’d likely never realize by sticking with a single approach. 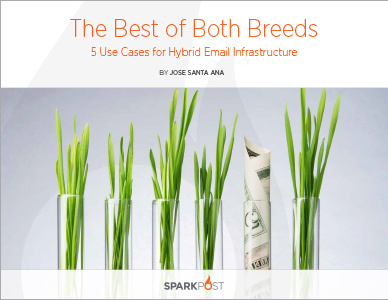 Download “The Best of Both Breeds: 5 Use Cases for Hybrid Email Infrastructure” and get started today!